The Iraqi government has come under increasing pressure to retaliate against Trump’s Muslim ban. Haval al-Kurdi, his wife and their three children were preparing to leave Iraq last month to start a new life as refugees in the United States. They were scheduled to fly to San Diego, California, and arrive on the evening of January 20. But just 10 hours before the start of their journey, the International Organization for Migration gave Kurdi a call that would change his life. They told me that the host country has changed their policy, and imposed a ban on refugees for 120 days,” Kurdi told Al Jazeera. I’m shocked and I feel hopeless. This decision is a matter of life and death for me and my family,” he said, noting that over the past 10 years, he worked with several American companies. “The terrorists and extremists consider me a traitor and infidel. Trump accuses me of being a terrorist Muslim. What do I do now? I need a solution. I need help.” US President Donald Trump’s executive order halted the US refugee programme for 120 days, barred Syrian refugees indefinitely, and imposed a 90-day suspension on visas for nationals of seven majority-Muslim countries: Iraq, Iran, Syria, Yemen, Somalia, Sudan and Libya. But a federal judge blocked parts of the order, and an appeals court unanimously upheld the judge’s ruling. The matter could ultimately end up before the Supreme Court. In the meantime, the move has caused anger and resentment in Iraq, where members of parliament voted to ban visas for US nationals in response. Prime Minister Haider al-Abadi, who rejected this request, urged Trump to review the Muslim ban, noting in a statement that the US president has “stressed the importance of coordination to find a solution to this issue as soon as possible and [said] that he will direct the US state department in this regard”. Five thousand US troops are currently deployed in Iraq to assist in the fight against the Islamic State of Iraq and the Levant (ISIL, also known as ISIS). Despite public pressure on the Iraqi prime minister to retaliate – including calls to expel the US ambassador from Iraq – Abadi told a news conference in Baghdad last week that he had no immediate plans to do so. “We have before us the battle to liberate all of Nineveh province [from ISIL] and other areas. I don’t want to affect the national interest by a hasty decision. But we have influence and we are working behind the scenes to change things,” Abadi said. Abbas al-Bayati, a member of the ruling Islamic Dawa Party, told Al Jazeera that the US was “supporting us in the fight against terrorism. I think the prime minister of Iraq and the Iraqi people appreciate that fact, and therefore the military relationship should not be affected by the travel ban.” Iraqi politicians, media outlets and religious figures, meanwhile, have lambasted what they called the government’s weak response. The government is trying to be diplomatic. But we need to be firm,” Aliya Nussaif, a member of parliament’s legal committee, told Al Jazeera. “We are victims of terrorism. Have you heard of an Iraqi blowing himself up in America? We have to take similar actions against Americans in Iraq. If the security agreement signed with the US does not respect and keep our sovereignty, then we should scrap it.” Although it is not clear how many Iraqi nationals have been affected by Trump’s ban, the United Nations refugee agency said that the order has put 20,000 people waiting for resettlement in the US in a precarious position. The US is the leading resettlement country in the world, according to the UN, with more than 145,000 refugees, including 11,000 Iraqis, applying in 2016. 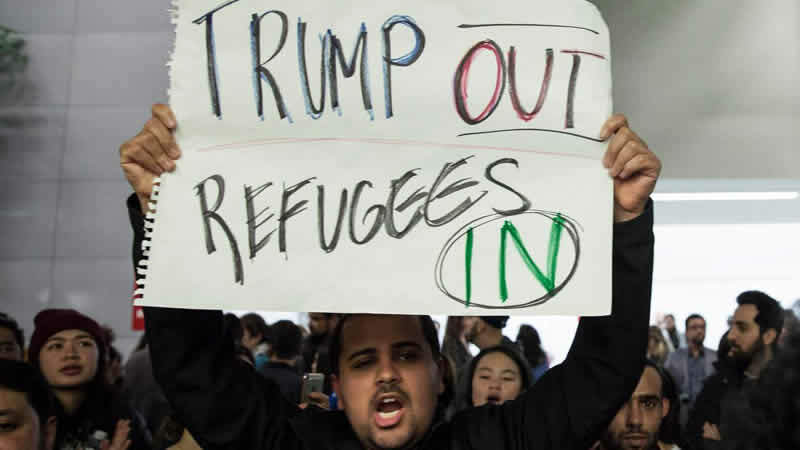 Since the 2003 Iraq war, thousands of Iraqis have been admitted to the US either as refugees or holders of Special Immigrant Visas (SIV), a programme aimed at facilitating entry for Iraqis who were employed by or on behalf of the US government and troops in Iraq. Some media reports have suggested that up to 110,000 Iraqis worked with the US between 2003 and 2011, the year that US troops withdrew from Iraq. In 2016, the State Department said that more than 2,000 Iraqis were issued with SIVs, while hundreds more were awaiting further processing.